Never am I more impressed with the curatorial efforts of Steve Panton, then when I see an installment of the ongoing Essay’d series at his gallery, 9338 Campau, in Hamtramck. Panton already has established his reputation as one of the most innovative and intuitive curators around the Detroit art scene, with his first gallery 2739 Edwin, that he ran out of his own Hamtramck living space. Panton’s passion for research and his interest in local history has translated into a gift for tracking and uncovering artistic diamonds in the rough, and the shows at Edwin were a proving ground for unheard-of talents, and a showcase for the rising stars of Detroit outsider art. During the first year of programming at his new gallery, which sits at street level on Hamtramck’s Jos Campau main strip, Panton has presented an array of fresh and established talent in the vaulted gallery space, including painter Saffell Gardner, months before the announcement as a 2015 Kresge Visual Art Fellow, fiber artist Lynn Bennett-Carpenter, and experimental musician Frank Pahl—a longstanding participant in the Detroit cultural scene, who is enjoying a Renaissance of interest at the moment. In addition to his ambitious move into a full gallery space, Panton piloted Essay’d, which presents essays on canonical Detroit artists, written monthly by Panton, Dennis A. Nawrocki, Matthew Piper, and myself. Roughly every three months, when a new “class” of ten artists has been essayed, Panton presents a group show at the gallery, and it is here that his curatorial skills are put to the test. The writers for Essay’d choose their own subjects, based on passion and interest, and as a result, every set of ten presents a challenge in a group show setting. Typically group shows are arranged around some thread of commonality—thematic, locational, art movement, medium—but the Essay’d shows gather together a set of artists chosen by a set of writers. Furthermore, though he provides input, Panton gives the artists much leeway over what works they provide for the show, creating a second layer of abstraction in his curatorial control. It is impressive, then, how much the Essay’d shows hang together in a balanced and interesting way. EXQUISITE CORPSE MACHINE (Prototype #3). All ages and skill levels welcome. Image courtesy of 9338 Campau. The opening, on Saturday, August 22nd, was a packed affair, with attendees of all ages and interests. 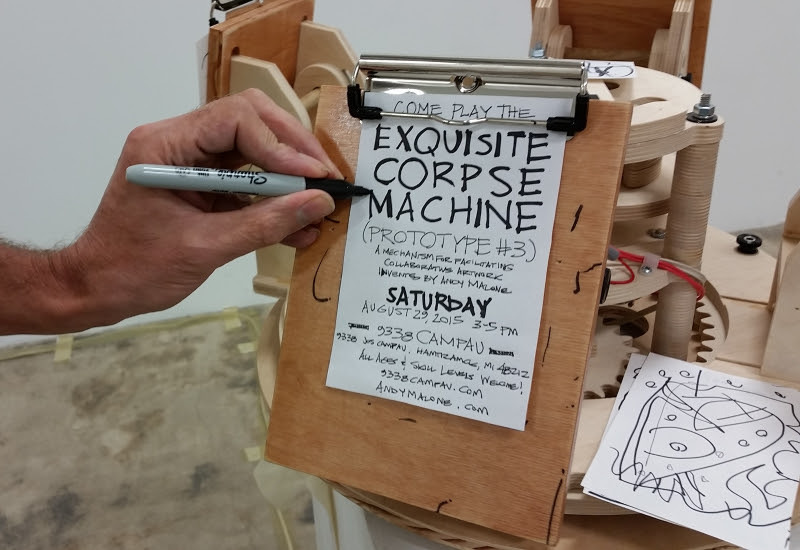 Children gathered around Andy Malone’s interactive “Exquisite Corpse Machine 3”—an elaborate wooden device mechanizing the old-fashioned game that forces participants to make a collaborative drawing. Malone will be on hand this Saturday, August 29th, from 3:00-5:00, for an exquisite corpse activity at the gallery, and nascent artists of all ages are encouraged to attend. Other standout work included Sandra Cardew’s breathtaking fiber works, blending fabric construction and delicate embroidery with traditional painting and sculpture, to create highly ephemeral and wistful pieces. 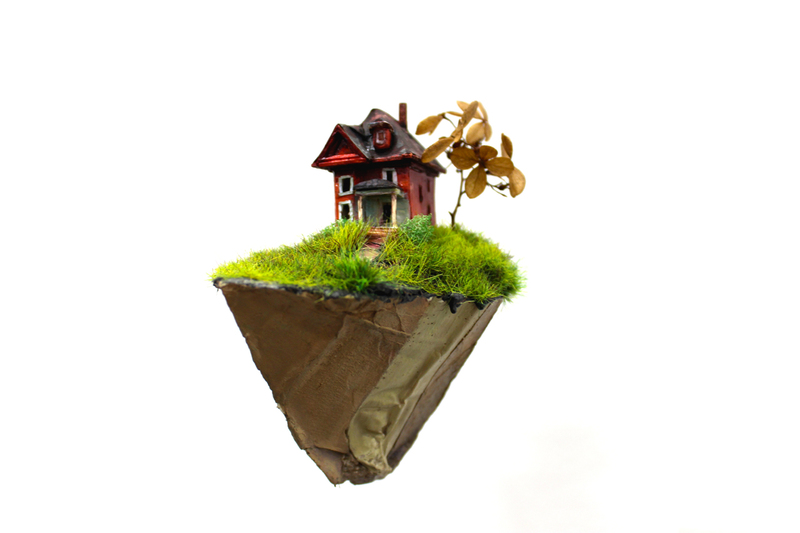 Clinton Snider contributed several small works, including a miniature house sculpture that appears to float midair, obviously from the same body of new work as “Sleeping Potential,” which he showed at Popps Packing earlier this year. A number of the artists presented work in their signature style, such as Mary Fortuna’s series of small paintings, which encapsulate a few variations on her perennial themes—bees, lotus flowers, third eye, and, of course, snakes—and selections from printmaker Toby Millman’s classic oeuvre. Ceramicist Marie Woo showed several trademark pieces, including a stack of green discs that was both formal and organic, suggesting an object somewhere between a pile of dirty dishes and an outgrowth of mushrooms from a large tree. Then there were the far-outsiders. Matt Corbin, the final artist in this particular Essay’d class, whose essay will go live on September 1st, just prior to the show’s closing on September 5th, showed a couple of truly offbeat found object sculptures, including an anteater made entirely from repurposed plastic water bottles. Interspersed throughout the gallery are selections from Jon Strand’s newest series of intensely inked pointillist works, which bend the very edge of reason and obsession with their literal waves of detail. 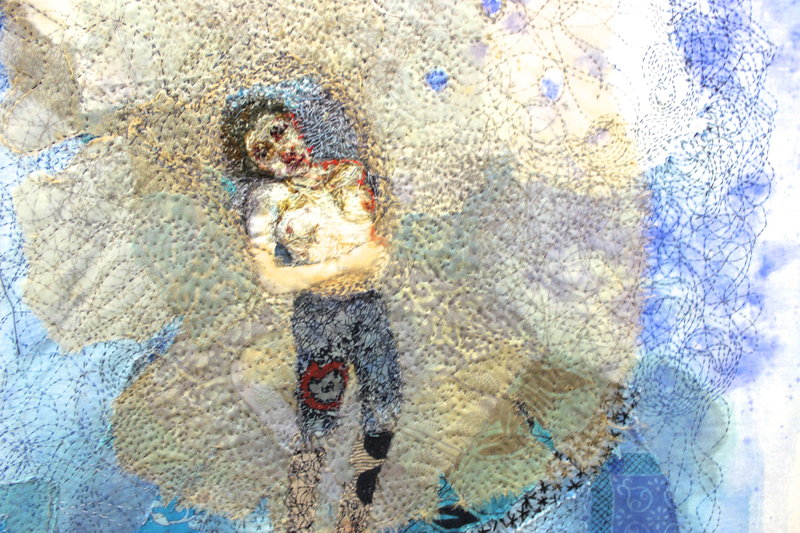 Finally, for the politically-minded, Shanna Merloa (essayed by guest writer Clara DeGalen) showed several archival inkjet prints from her series, “We All Live Downwind,” which utilized collage to raise questions about impurities in the water system. Native South African artist and CCS professor Chido Johnson showed “Revolutionary Residue”—early works in the form of cast cement fists that he says were created in the spirit of historical reference to post-apartheid South Africa, but he finds remain tragically relevant in the context of America’s current day struggles with race relations. As always, the Essay’d show provided an opportunity to revel in our favorite artists, and discover some new ones. As a visual entry point into the artists chronicled on Essay’d, it provides an excellent chance for cross-pollination—people may see something in the gallery that draws them to read an essay on the website, or vice-versa. One sense that Steve Panton has learned to get the art to the people any which way he can. Kudos! Scott Hocking is a canonical artist in the Detroit art scene, internationally famous for his site-specific monument building, typically out of objects found and installed amidst Detroit’s urban ruins . 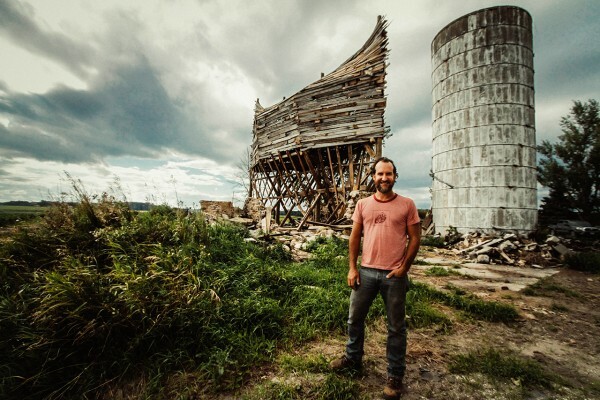 Recently, he has ventured to the tip-of-the-thumb town of Port Austin, MI, to work on a massive rebuilding of a derelict barn into an ark-like vessel that is a rural twist on Hocking’s powerful practice of self-executed acts of mythology. We sat down for a discussion about the ins and outs of “Barnboat,” the stubborn and meditative process of solo monument-building, and the underlying belief that fuels Hocking’s unstoppable drive to create and abandon these structures. Sarah Rose Sharp: Okay, so can you walk me through, again, some of what brought you to Port Austin, and what’s happening there, in general, with the barns? Scott Hocking: Sure. Jim Boyle brought me to Port Austin. There’s an entire Boyle clan that lives in Port Austin. And Jim tells me the story of some old Detroit Cass Corridor artists moving up there—the Mikolowskis—which inspired him to bring Detroit artists up to Port Austin. The thumb is also, as everyone has told me a million times, a peninsula within a peninsula, so nobody passes through it. SRS: So you would think tourist town, but actually it’s really insular. SH: Right. It’s like going down a dead-end street, and then you’ve got to drive back. SRS: Yeah. But, it’s a great drive. SH: I’ve been taking different routes, and I’ve found some things. SRS: I saw a sign for “Petroglyph”—did you go see that? Is it a good one? SH: I did. The petroglyph is a large, flat sandstone outcrop, uncovered during the great fires of the thumb, which burned down most of the white pine. The petroglyphs were uncovered then, but I think that’s 120 years ago or more. And since then, the sandstone has just eroded. SRS: It’s interesting to me that as you’re building this project, you’re also collecting stories of the thumb. You’re doing kind of an anthropological study. SH: That’s a huge part of how I operate. It’s probably the reason I do artwork like I do, because of my amateur interest in this kind of stuff. It all informs the piece. SRS: Is there anything that’s cropped up about Port Austin reflected in the barn installation? SH: In every case, I’m really influenced by the environment. The location has literally shaped the object; it’s changed from what I originally thought it would be, which was an upside-down barn that looked kind of like a ship, to being a very aerodynamic wooden shape—that’s all based on the wind. SRS: The wind sprung immediately to mind—that you were talking about how much that impacted you. SH: Yeah, so I’m interested in mythology, but I’m also interested in how the ancient people were really beholden to the elements. I like working like that, too, where even if I’m in an abandoned building, I’m in a circumstance where the elements are hugely a feature of what I do. [For the barn project] I can’t work around rain—the machines won’t work, the tools won’t work. So suddenly I’m like a farmer, where I have to do everything based on what the weather tells me. A lot of the objects I took out of there that are directly related to the history of the barn, of the family [that owns the barn]—parts of the barn itself, sections of the beams, beautiful wooden pegs and notches—they will be displayed in the grain silo, in a kind of reliquary. SRS: And in the past, you’ve been accustomed to being able to work long-term on big pieces, which is significant. One of the reasons that your pieces are awe-inspiring is because they obviously represent a huge amount of human labor. SH: I come from a background where the idea of art was kind of laughable. Like, such a working class opinion of the art world—but the one thing working class people appreciate about art is when they see that somebody worked really hard. And I think there’s still that in me. I mean, I’m stupid about it. I worked myself to the point where I can’t work. I also think I’m kind of stubborn; I want to do everything myself. I want to control everything. So taking on a project like this, when it’s really the kind of project where you should have assistance, but wanting to do it alone so badly—that’s me being stubborn. Because I could have had more help, if I had really pushed for it. SH: And that has happened, plenty of times. People will stop their cars right in the road. They might actually drive down the road, and sometimes they’re yelling up to me while I’m on the lift. But I would say ten times, someone has said, “You’re like Noah, making the ark!” And in some cases they’re saying it like a ha-ha—in some cases they’re saying it like they’re in awe. I know I’m going to seem crazy. When I made the pryamid a Fisher Body , I can specifically remember people making comments like, “Dude, what are you doing? You’re acting crazy.” I push myself like that every time, and I just believe there’s going to be a lot of awkward stages but I’m going to figure it out. I have to believe that. But when you’re not in your studio, when you’re not in this confined space where nobody can see you—when you’re out on a lift along a road, then people are going to see you during those stages, and they’re going to see how crazy it is. SRS: I’m being a little playful, here, but I’m sure Noah had moments of self-doubt, too. I’ve never seen the pyramids in Egypt in person, but I remember finding out what they were, and having the reaction, “Wow, people made that.” And I don’t feel that way when I see a skyscraper in Shanghai. I think, “Industry made that, machines made that.” But the pyramids, Stonehenge—people cut massive stones out of cliff-sides and then rolled them on logs hundreds of miles, and stood them up in these formations. And there’s a human energy to that. I think, when you engage in a process that mirrors those, that’s how you know what that means. When you put your body through that experience, you can access something that is fundamental. SH: I think that’s true. With the barn project, I’ve been in awe of the people who made the barn. Every log that was hewn by hand—every log was made square by hand, and you can see the hatchet marks—every peg, every hole, so well done. The amount of effort and skill and time and patience blows my mind. So there is a feeling of respecting that, wanting to respect that, even though I’m not going to be doing anything near what they were doing. There is a part of me that likes being up there with a hatchet and a sledgehammer, and if something doesn’t fit, I’m going to pound it into place. SRS: I think that’s what an ark is, right? It isn’t a yacht, or a sailboat. It’s a mythic vessel, rough-cut out of the raw elements with very little help because everyone thinks you’re crazy. SH: I’ve worked before where I’ve layered wood in this way, where I feel like I’m just layering and collaging. I don’t want to make a perfectly sealed, perfect boat. 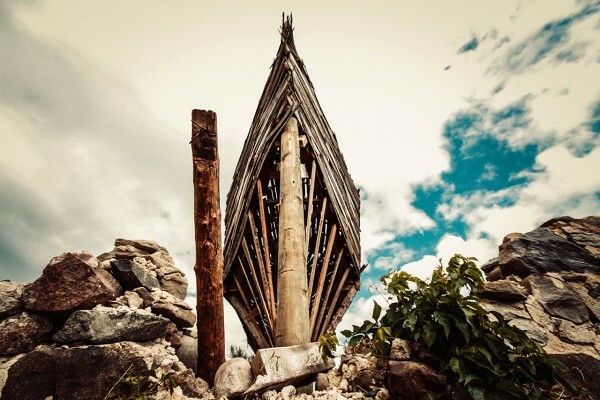 This isn’t a boat—this is an object, this is a sculpture. It’s vessel-like, it’s ark-like, it’s ship-like, it’s boat-like. SH: Totally nest-like. Well, this is a great tangent to take, because I love birds. There were barn swallows living in the barn site, and I basically destroyed all their homes—they were pissed at me. Anyway, this is becoming a new nest for birds already. Every time I come back, the birds fly out. They’re already getting in there. SRS: It’s great, out of the wind. SH: They’re going to love it in there. It’s going to become a weird little bird sanctuary, so that excites me. One day I came in and there was a vulture on top—coming back to when you asked, have I been influenced? I’ve been influenced by the nature around me, for sure, in ways that I don’t know if anybody else really cares about. But I’m out there alone, spending time with the birds, a lot. SRS: Well, yeah, that makes sense to me. And it’s how mythology happens. Like, maybe Noah’s Ark is exactly what you’re doing right now. 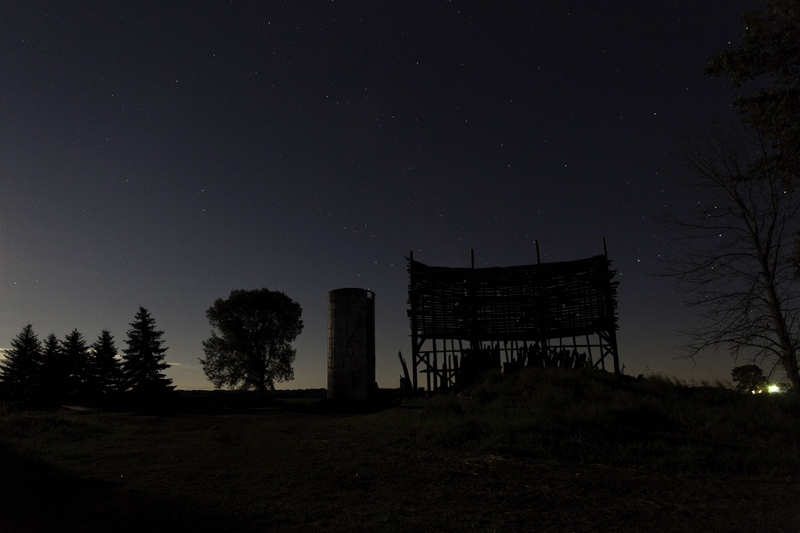 Some guy one day thought, “This barn is in terrible repair, maybe I’ll build it upside down to make a kind of boat shape,” and people said, “Uh, Noah, what are you doing?” And he started shouting, “THERE WILL BE A GREAT RAIN,” just to get them to leave him alone. And birds start flying around him, a lot of wildlife is drawn to his boat—and then there’s a really bad rainstorm, and he becomes a mythic figure. SH: That’s great. It’s possible. I mean, I have to tell you, there’s been a lot of people coming out of the woodwork, talking to me about barns now, and Noah stories. People have been sending me stuff about barns—“Hey, I saw the project you’re doing. Not sure if you knew this, but the Mayflower boat was turned into a barn.” Apparently that’s what they did with the Mayflower. SRS: That’s wild. I mean, of course you’re not going to waste a resource like a ship, right? And it’s interesting that settlers came to a new place, and the first thing they built was a barn. SH: Maybe it’s not so unusual to have this thought about the barn and the boat, like, that shape—that protective vessel shape—either, it’s keeping something in or keeping something out. SRS: So how long have you been working on this piece? SH: I started on June 1st, 2015—about 8 or 9 weeks so far. SRS: And can you talk to me about why don’t you own your art objects, once you finish with them? SH: I like practicing not owning anything, practicing letting go of things. Having attachment to material objects is something I’m not interested in, so through my art practice I started to become really good at letting go all the time. SRS: You use found materials to make your pieces, so you’re constantly picking things up, and then letting them go. You’re moving through things, without being attached to them permanently. SH: Yeah, and I think I’m that way in life, a bit. When I was 18, I threw out everything I owned, and I don’t think I’ve ever regretted that. I still kind of feel that way now; if this [his studio] all burned down tomorrow, there are things I’d miss, but I’d also be okay with starting over. This way of working with art is a reflection of the way I approach everyday life, and there’s something maybe spiritual about it, something maybe meditative about it. SRS: So you’re meticulous in the execution, but then it’s done and it sort of goes out of control. SH: The “I Ching” is very influential in my life, I’ve been doing it for years, and I’ve really connected with it, because it’s this belief in chance. You believe things happen certain ways, and you go with them and learn from them. Trusting that there’s a reason for things happening the way they are. Battling a feeling of, Wow, what the hell am I doing? with, You’re going to figure it out. You have to trust that it’s all going to work out. SRS: I find as an artist, sometimes the inspiration that comes to you in a flash takes unimaginable amounts of work to execute. SH: Sure. And in my case, I’m literally building this entire thing based on a flash moment. So there’s certainly doubt, and that’s another part of the process. It’s a process to constantly remind myself of what’s most important to me—and what’s most important to me is not the object, or possessing the object. It’s the process. So that’s the meditation that I go through. SH: You know, for most of my life, I had a kind of internal dialogue that was very negative. I came from a background where it was a lot of people talking about how terrible everything was—so much negativity. At some point, I really started to believe in myself, and it’s been this constant, slow, gradual climb, to where now I’ve got voices that say, “You’ll figure it out. You can figure it out.” It’s really great to be in that cycle now. SRS: And if you believe in that chance element, then whatever setbacks happen are going to inform your process in a way that is actually part of the plan. SH: That’s right. And there’s always little things that happen along the way, that to me are signs that everything is happening the way it should. I really believe ancient people understood that you have all the answers within yourself, but to get those answers, you almost have to trick yourself that you’re getting them from the outside. I feel like that still works really well to this day, and people still find the answers within themselves by believing that they’re coming from an outside source. I don’t think there’s anything wrong with that. In my opinion, if we’re talking about Noah hearing the voice of God, that’s Noah talking to himself. You have all the answers inside you. This blood, coursing through our veins, has never died. This is the same blood that all humans have had from the first human, slowly branching out from a tree, and I think that there is some latent, DNA-type memory. SRS: Right, that’s what I was saying about the pyramids, that it’s inside you. You’re enacting a process that enables you to connect with a human truth that fundamentally exists. SH: And artists, I think, are often the ones who figure out a way to tap into that. I think a lot of what my work ends up being, is me tapping into that. in Port Austin, Michigan. Hocking is taking a sabbatical from the piece in order to do an installation in the Lille 3000 Triennial , in Lille, France, and will complete work on the piece in October of this year. From its first space in Greenwich Village in 1931, to another home at Madison and 75th Street in 1966, to its new home at 99 Gansevoort Street, the Whitney Museum has been deeply rooted in celebrating American art. Sculptor and patron Gertrude Vanderbilt Whitney was the driving force behind its development as she recognized the difficulty American artists were having exhibiting their work. Trying to keep up with its growth, it had established branches in various parts of Manhattan, and Stamford, Connecticut. The new building at 99 Gansevoort Street is designed by the architect Renzo Piano, includes approximately 50,000 square feet of indoor galleries and 13,000 square feet of outdoor exhibition just east of the Hudson River. At the northern edge of the Meatpacking District, and the foot of Chelsea where the new High Line begins, is New York City’s newest and most unique public park. 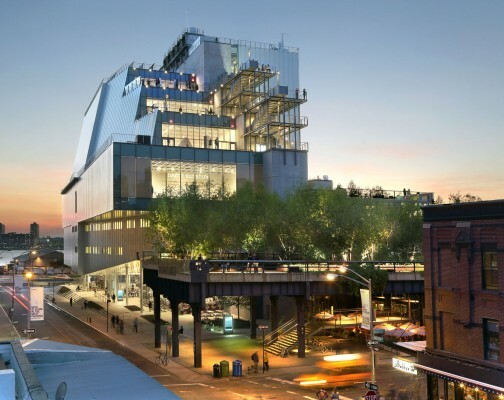 As an artist and writer whose family is from NYC, the location choice for the new museum seems perfect, and at first glance, the interior space has an abundance of glass and terraced exterior space. One of the most impressive observations upon my first visit was the gallery interior wall. The fifth floor, for example, has 18,000 square ft. of open space where the 12” thick walls look and feel stationary, but, in fact, are movable. When you look up, you see a very thick steel grid that explains how these museum walls can be moved and repositioned based on curatorial design. The first exhibition at the new Whitney Museum is America Is Hard to See, which provides a vehicle for its collection of American art that has been described as one of the arguments for moving into a new space. The collection includes over 21,000 works of art by more than 3000 artists who worked in the 20th and 21st centuries. The argument is that the Madison space never allowed for the proper leverage of the collection. 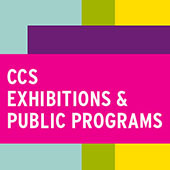 This first exhibition, illustrates its capacity. 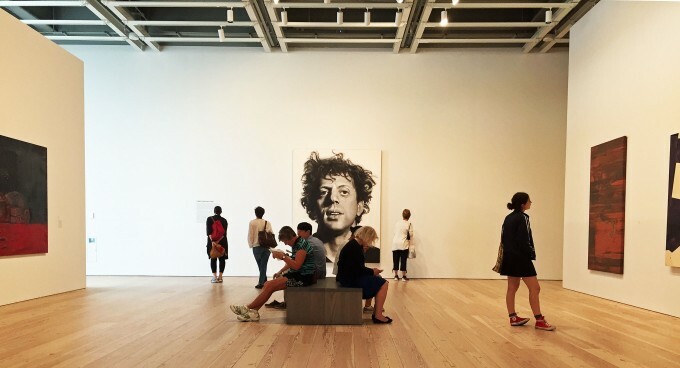 Here in this installation image, Phil, 108 X 84, by the artist Chuck Close, one gets a feel for the gallery space. From his initial series in 1969, this acrylic and graphite on canvas presents a frontal portrait against a neutral ground. Close took an 8 x 10-inch photograph of his friend Phillip Glass, overlaid it with a penciled grid, and then painted a vastly enlarged blowup of each square onto the canvas using airbrushes to create a photographic image. In all the galleries, the flooring is reclaimed wide-plank pine from locations near the city and virtually column free. 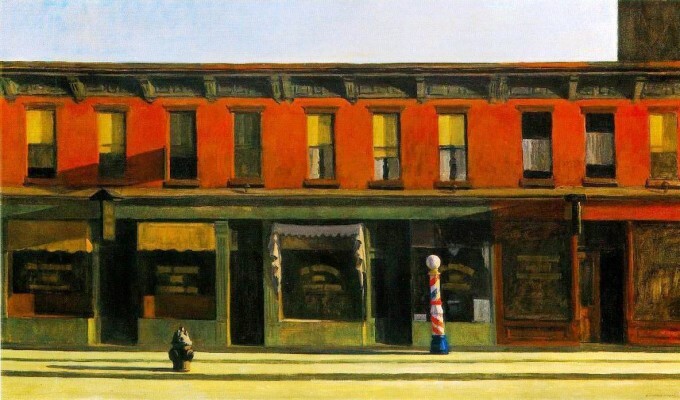 The theatrical painting Early Sunday Morning, one of Edward Hooper’s most iconic paintings, takes its place in the exhibition as an example of social isolationism in this painting of Seventh Avenue, a north-south street, where light from the east cast it long shadows. Although Hopper is known as an archetypal twentieth-century American realist, his paintings are fundamentally representational. This painting demonstrates his emphasis on simplified forms, painterly surfaces, study of light and a thoroughly contemplated composition. 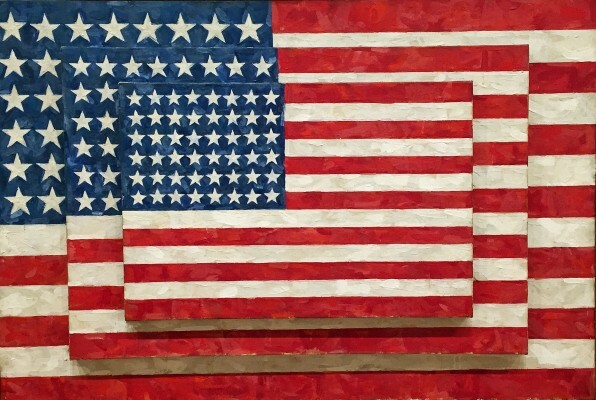 Three Flags is a signature image of Johns’, who got lumped into the Pop Art category by default when he decided to use everyday images in his work. 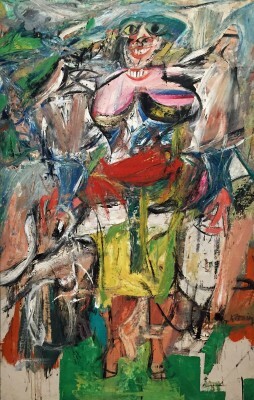 Painting targets, maps, letters and numbers, Johns led some artists away from the abstract expressionism of the time. The familiarity and simplicity of his subject matter attracted audiences, often grounded in the imagery that was part of the everyday world at a time when the art world was searching for new ideas. In a statement, he says, “My work is largely concerned with relations between seeing, and knowing, seeing and believing, seeing and saying.” In Three Flags, he shifts the emphasis from emblematic meaning to a change of scale, discrete marks and surfaced texture. 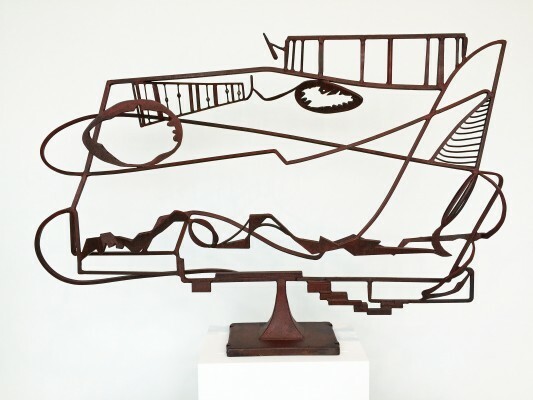 David Smith made what he called “drawings in space” using welded steel, as in Hudson River Landscape in 1951. Sometimes known as an abstract expressionist sculptor, similar to Pollock, Smith’s life was cut short when his pickup truck spun off the road in a crash near Bennington, Vermont at the age of 59. Best known for the Cubis, a series of stainless steel hand-brushed geometric shapes, his works have been included in exhibitions at the MOMA, Solomon R. Guggenheim Museum, Whitney Museum of American Art represented by M. Knoedler & Co. and Gagosian galleries.Smith continued to paint and draw throughout his life, pieces that included landscape and figurative work. 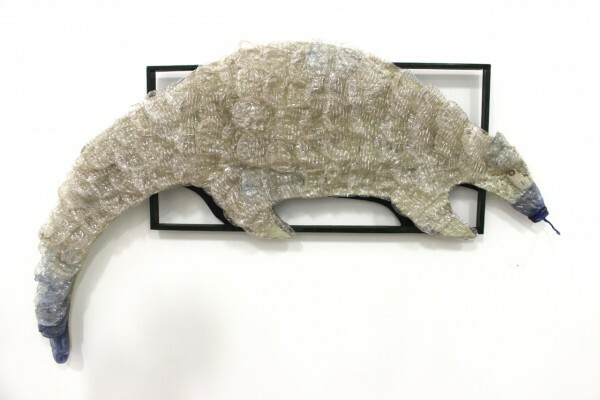 Most of Smith’s work is an object lesson in what scale means with respect to the viewer. His work was that of a welder, not a forger, and is often referred to when expressing the concept of Constructivism. For this viewer and many others I assume, the painting Woman and Bicycle is the 1950’s hallmark of Willem de Kooning’s work. Acknowledged as one of the most influential Abstract Expressionists, he says in his statement, “I’m not interested in ‘abstracting’ or taking things out or reducing painting to design, form, line, and color. I paint this way because I can keep putting more things in it–drama, anger, pain, love, a figure, a horse, my ideas about space. Through your eyes, it again becomes an emotion or idea.” The most distinguishing attribute in Woman and Bicycle are the two smiles where banality meets beautiful. As for what will become of the space on Madison, The Metropolitan Museum of Art plans to present exhibitions and educational programming at the Whitney’s uptown building for a period of eight years, with the possibility of extending the agreement for a longer term.